Mazda will launch a special 25th Anniversary Limited Edition MX-5 Roadster Coupe at the Goodwood Festival of Speed this weekend. Powered by the 2.0i engine just 750 will be built priced at £22,995 and available from August. And to celebrate the 25th anniversary of the iconic MX-5, Mazda will have two stands at the show with one dedicated to the MX-5 with a range of models on display, including 10th and 20th Anniversary, California, Le Mans, Sport Black and Sport Graphite special editions. Mazda's growing motorsport pedigree will be on display with the MX-5 production race car which contested most recently in the Birkett 6-hour Relay Race and the Britcar Production Sportscar Series. 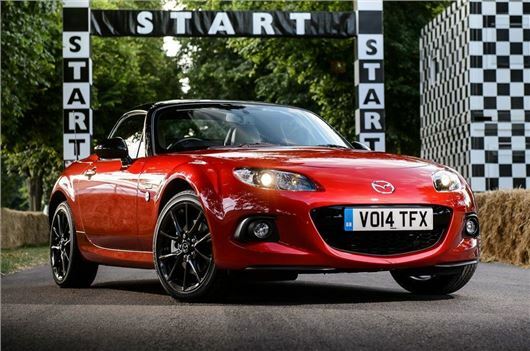 There will also be several cars that inspired the first Mazda MX-5 in 1989 including the Lotus Elan and MG Midget, along with a rare Mazda MX-5 GT4 race car and the chassis of the all-new Mazda MX-5.